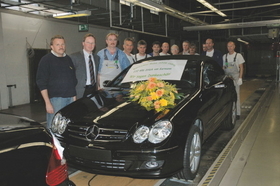 A Mercedes CLK class was the last car to roll off the production line at Karmann. OSNABRUECK, Germany -- When the 225,576th Mercedes-Benz CLK convertible rolled off Karmann's production line earlier this month, it was the last complete vehicle produced by the German coachbuilder. Since 1949, when it started producing the VW Beetle convertible, the company has built more than 3.3 million vehicles. The company's most successful contract was for the VW Scirocco. Between 1974 and 1992, it built 795,650 units of the sports car. Karmann had already stopped building the Audi A4 convertible in February. The A4 model had been assembled at its facility in Rheine. "The phase-out of vehicle production could no longer be prevented since the automaker's production strategy has changed," said Ottmar Hermann, the company's interim bankruptcy administrator. "But Karmann is more than vehicle production." Hermann is working on a plan to allow the company's three remaining divisions to continue operating. They include convertible roof systems, vehicle development and the metals group. The company filed for bankruptcy on April 8, due to a lack of contracts and compensation owed to laid-off workers. CEO Peter Harbig announced in September that the contract manufacturer would develop into a "flawless auto supplier." Like many of its competitors in recent years, the company was no longer able to win new contracts for complete vehicles from automakers. Automakers' plants have become more flexible recently. That has enabled them to keep costs down even on small production runs. Also, automakers are under pressure to operate their own facilities at full capacity. Hermann is now seeking a buyer for the financially battered contract manufacturer. Talks are also underway to obtain orders for its vehicle development and convertible roof divisions. Both are considered to be sustainable. Any contracts would help the company raise the nearly 20 million euros ($28 million) needed to help laid-off workers with their transitions to other jobs. At the end of June, Hermann said Karmann will still pay wages to about 1,550 employees. With the end of vehicle production, a total of about 2,000 people will lose their jobs.